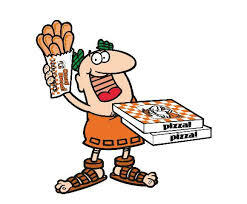 View Poll Results: Pizza Hut, Dominoes, Papa John's, or Little Caesar's? Mainly their Stuffed Crust Pizza! Also love their crazy bread (if made right and not burnt)! Out of the big four chains that has pizza as their specialty, which do you prefer?? I can't actually believe we have another pizza thread going. I think there is a new one every couple of weeks. My answer; they are all crap,but depending on where you live some are better, some worse than others. I see Pappa John's is the favorite and yet here, the worst pizza I have had in ages has been there's. I think the only pizza places I even enjoy trying are: one of our local small chains and we do like Papa's Murphys but you have to bring it home and bake it yourself. Are you under the impression that the typical "Anthony's Pizziera" in any given town is getting their ingredients from someplace other than a national distributor? Or that their fresh locally grown green peppers and onions are any fresher or more locally grown than what the chains use? Quit romanticizing this. Almost all combinations of dough, tomato sauce and cheese taste pretty good. If anything, the local places will tend over or under-cook their products due to just using the eyeball method of checking when it's done. At least the chains using convection/conveyor ovens never, ever get the time wrong. Now that i just answered I noticed this thread is 8 years old. I have to wonder why you decided to re introduce it when we have been posting about pizza and pizza places off and on for the past few months? This just seems like a repeat only asked in a different way. If I only had those four to choose from (but loved the crap choice lol!) I would choose Pizza Hut. Sorry, most places have a local independent pizza shop. Sure, those places can produce mediocre pizza, but more often than not an independent place will blow the national chains away, and they're just as fast and convenient (almost every one has a website, after all). You left out Dominoes. The two closest chains to my house are Dominoes and Pizza Hut. The thing that makes it hard to answer is that the results are uneven. We have gotten absolutely delicious pizza from both places, but not on a consistent basis. We do not like thin crust pizza, so we get deep dish or hand tossed. When they get the crust right, everything else is pretty much a no brainer, except sometimes, Pizza Hut is a bit skimpy on the sauce. We also have some Mom and Pop places, but we really don't like them as well. One thing that I absolutely do not get is why pizza places think anyone under 400# would want to buy breadsticks with pizza? Dominoes is on the list, not that it matters. 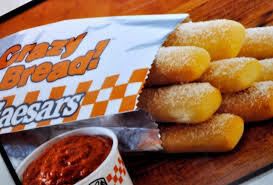 I have no idea who would want want bread sticks with pizza. Teenagers? My son and his skinny friends would eat anything they could get their hands on. Out of those places.. 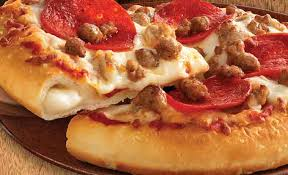 I pick Pizza Hut..
Papa John's sauce sends me into heartburn hell. Domino's.. I'm just burned out on.. Still. I worked there in college (20 some odd years ago) and don't want anything to do with them. LOL - no, that's not how it works. The dine-in pizzas are carried to the table immediately. The take-out pizzas are boxed and sit steaming in the box until the customer picks it up and decides to eat it. Steam doesn't do anything good to a pizza.